We had abut 250 in Los Angeles where the event was held (Gnomon) and interconnected to New Zealand, the San Francisco Bay Area, Vancouver and Austin. I touched on this yesterday and here's the website with more info of the things going on. See vfxsoldier and links on upper right for additional info. Below is the script notes I started with for my talk. I wasn't able to cover everything in the time provided and since I was free speaking most of it, I probably lost a few things along the way. I've posted a link to the YouTube of the talks and discussions at the end. (And thanks for all the great responses and feedback. Let's keep the discussions going and lets implement some solutions ). I’m Scott Squires, started on Close Encounters, started up and ran Dream Quest for a few years, was at ILM for 20 years and I run the Effects Corner blog. Each year we as the vfx community pushes the boundaries of what we can do. We develop the art, skills and technology to do more and more. This last year we have seen incredible work. Our efforts have allowed filmmakers to tell any story. We have made the impossible, possible. We are involved in not only most Hollywood films but also almost every form of moving image content. All films that were up for best picture this year used visual effects. The studios are reaping large benefits from our talents. We should be celebrating instead we find ourselves scrambling for coins in the gutter. We have allowed visual effects to NOT be considered for creativity, collaborative and quality. We have allowed the discussion to simply become a decision of costs. Films do not hire the key creative’s based on how inexpensive they are. With the bankruptcies of R&H and DD and closing of other companies I the last 6 months, it’s clear that our industry is out of balance. These are basically government funded corporate subsidies for select industries in select areas. Politicians are controlling who wins and who loses. The evolution of companies is no longer based on creativity, collaboration, quality and efficiencies. No matter how great a company is they can’t compete with a 50% or more discount funded by the deep pockets of governments. Subsidies do not create jobs, they simply move them. VFX companies are forced to setup expensive branches in locations with subsidies. The vfx professional is now forced to move from place to place like a migrant worker. We still work in offices and the moves are only based on these politics. The taxpayers in those areas are paying a high price. Louisiana recently discovered that they make less than 16 cents for every dollar spent, even factoring the intangibles and the multiplier effect. No unbiased report I’ve seen has shown any benefits to the taxpayers in those areas. Building an industry based on subsidies means building it on a house of cards, ready to collapse when the subsides go away. And they will go away. The subsidies are one of the next bubbles to pop. They are temporarily. Film subsidies require constant feeding. Another location will provide better subsidies or your subsidies will go away. The BC film industry is seeing that with work now going to Ontario and Quebec. UK companies are now setting up branches in Montreal. If tomorrow Antarctica announced a 70% subsidy, the studios would be on the phone to all vfx companies and the vfx companies would be scrambling to setup in Antarctica and requiring many employees to pickup and move if they expect to keep working. 6 Months later a small island in the pacific will offer more and the cycle will repeat itself. This is ridiculous and as insane as it sounds. Yet this is what is happening. You can see a time lapse version playing out in the US. Michigan was top dog a short while ago. They are no longer top dog and now have shutters studios and businesses simply because they falsely believed they were building an industry. Everyone in visual effects is affected by the subsidies. The amount of visual effects in films and other entertainment has exploded in recent years. But there is still too much competition. The subsidies have caused a distortion in evolution. Companies are trying to get a small profit from the projects. The companies have no leverage due to this imbalance. Large companies, even in subsidize areas, are underbidding the actual cost of the projects. Anybody with common sense can see that doing projects in the red will end in the company going out of business. The visual effects business model is a fixed bid. A fixed bid for a creative process that starts as simply vague writings and has a fixed deadline. We are the only industry in the world that operates this way for a process with so many unknowns and so many changes, large and small. Construction requires blueprints and selections. Any changes are billed and deadlines are extended. The fixed bid is an insane way to work and results in companies going out of business. And it should be pointed out that when these companies go out of business they leave a trail of unpaid workers. Because at the end of the day the workers bear the brunt of all of this. It’s not the studios or the companies. Unions fought and won to help make a 40-hour week standard. Most countries have a maximum allowable number of hours a person can work. The Fair Trade Association that Apple, HP and other companies belong to that covers China and other countries has a cap of 60 hours. In visual effects many of us start at this number of hours and increase from there. 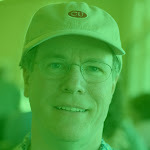 As vfx professional we’ve already exceeded what both many countries and associations allow. In there UK they have a maximum hours of 48. But vfx workers are required to sign a waver when they start. As overtime goes up, productivity goes down. There are now health studies clearly showing the impact to workers health when worked over 50 hours. Why on earth are we working the hours we’re working. Many putting in these hours are doing so unpaid. Many vfx companies are breaking labor laws by misclassifying people, making workers exempt from overtime and other questionable activities. In Vancouver they are classifying people as technicians to get around overtime laws. In the UK there are no requirements for overtime rates so many are simply given a standard day pay, if anything at all. This is the only US centric problem I will mention. Health care here is very expensive. Each new company you work for requires 3 months before coverage. If you work shorter than that then you will have to buy your own. That is one of the reasons why all other film crewmembers are union members, including writers and directors. Because they offer continuous benefits as crewmembers move between projects. There are plenty of other problems but we need to focus on these first. The visual effects industry is like large ship that’s burning, sinking and headed towards a waterfall. It would make a great movie but we are all on it. All of us. There are some on the ship that see no problems, some that simply want to hold on and hope for the best or hope that someone else will come to the rescue, others argue about which to fix first and of course there are plenty that just complain without solutions. Vxfsoldier has started a legal team looking at the issue of subsidies under the World Trade Organization, which technically lists these as illegal under their guidelines. But beyond this there is little we as individuals can do solve this problem due to the politics and the deep pockets of lobbyists. Many have suggested that vfx companies make their own content. That this would provide an alternate revenue stream that would help cover costs. But being a content company is a different business than being a vfx service company. Some vfx companies have attempted this with varied degrees of success. It is certainly worth exploring but bare in mind large amounts of money have to be obtained and invested. It would require companies to invest large sums themselves to create the concepts, hire writers and directors as necessary. And even once this has been done there is no guarantee of success. Even the large animation studios are not always successful at doing so. If your company was successful in create such content, would you even bother being a vfx service anymore? Especially if the vfx business was still broken. The other notion is that vfx company’s share back ends participation. Perhaps even the workers. If you think getting more credits is hard, try to get a valid back end. There are some vfx companies that have done so with varying success. But this usually requires the vfx company to bankroll a certain amount of their own production for which they require deep pockets. And what happens if these projects are unsuccessful or make no return on investment. How deep are the pockets of the companies, especially since they work on very low profits currently. Keep in mind people such as writers get residuals based on their union coverage. Most film crews get residuals in the form of health and benefit fund payments. When you buy a DVD a certain % goes into that fund. So again, vfx workers are the odd man out with no participation in the profits of the projects. The studios could simply employ vfx workers directly, just like they do film crews. This is the way it used to be done. There would be a direct connection between decisions the director makes and the cost, just like there is for the rest of the movie. This isn’t as far-fetched or as impossible as it sounds. There would be some benefits to workers and could be an advantage to the studios and directors as well if it were done right. But the vfx companies today offer the studios the ability to take all risks over themselves and the vfx companies also offer doing the work below costs. Hard to convince a studio to do their own when others are more eager to fund their projects and take on the risks. Just like the Fair Trade Associations and other organizations mandate a specific code of conduct for companies; there could be a code of conduct for vfx companies to adhere to if they wished. Those who do so would be clearly listed and overtime and health benefits would be clearly defined. Should a company break any of these guidelines they would be off the list. All companies on the list would be required not to subcontract to others not on the list. And the studios could not plead ignorance. A trade association would be made up of vfx companies. By organizing they create a unified front, with numbers comes strength and leverage. Just like a union. Companies in the trade association couldn’t agree on pricing but they could establish standards and also define their business models. The goal of a trade association is to do what’s best for the companies involved. The film studios have their own trade association for negotiating with the unions as well as take care of issues affecting all of the studios. The VES hosted a few meetings with some companies and Scott Ross has been trying for years to get companies on board. The larger companies and those in subsidies areas have been reluctant to even discuss the possibilities. But the vfx protest that many of you were involved in has seemed to make a bit of an impression. Scott Ross will be discussing the trade association tonight. A guild and union are one and the same. As mentioned almost all others involved in the film industry are covered under guilds. Writers, directors, production designers, cinematographers, actors, etc. Please don’t stereotype unions by what you have heard 2nd hand. And please don’t bother bringing up false notions of the auto industry. The German auto industry is doing just fine with a union work force. The union provides protection for the worker. As an individual you have very little control at your workplace. The company could drop everyone’s pay without notice. They can do things to skirt around the labor laws. A company may not pay you for a few weeks and simply say that they will pay you soon. (Dave Rand can discuss this aspect) All of this is even more possible at a time of large unemployment. You have no say over your situation. You either keep working or you quit. Those are your two options. The guilds goal is to do what is best for workers. Workers are involved in the management of the guild and are involved in determining what is critical. The guild sets up basic working conditions and they set minimums. Everyone is still allowed to do their own negotiating higher as they choose. And guilds are not only here in the U.S. There are in a lot of countries including Canada, UK, New Zealand and even India. China is one of the few places where unions are not allowed by law. So those are many of the potential solutions. None of these will fix all of the problems. We have different members on the panel that can discuss different aspects of some of these possible solutions. And if other have better solutions please submit them. Since this is a town hall event primarily for the workers let’s take a look at the solutions they can be involved with. From my perspective a VFX trade association would be a very good thing and help build a more sustainable business model. I would suggest to all workers to ask management if they have an interest in a trade association and would be willing to meet about one. If not, why not? We as workers don’t control the politicians, we don’t control the studios and we don’t control the companies so lets look at the options that are left. 1. Do nothing. Hold on and simply hope you don’t end up unemployed and/or half way around the working next year. 2. Quit the business. Some have already done so and more are more making plans. 3. Unionize. We now have a large group of motivated workers around the world. We’ve changed our Facebook images but how do we put that into real results? For real change to take affect we will have to truly be organized in a contractual form. I know some people say they want working conditions, they want to be paid the hours they work, they want collective bargaining to get continuous benefits but they don’t want a union. The problem is you’ve just described a union. Here in the US there are specific laws and regulations. To do those things you have to be a union otherwise you’re an organization that submits petitions in the hopes someone may read it. Ideally a union would be global but given the range of laws in each country that’s not possible. The best option is a per country union that can be loosely connected. Some say they wish to start a union from scratch. How much time will that take to get through all governmental approvals, to get acknowledgement from companies, studios and other unions? And in the end what do you have gained? Now there will be those that say a union will be too expensive, that the companies can’t handle it. That all work tomorrow will go to China or the cheapest place this week. It does the union no good to create a large added cost to the companies, which cause the companies to fail. The unions would negotiate with the companies to develop a reasonable solution for both sides. And remember, I’m not just talking here in the US. If you wish some protection as a worker you should consider joining a union. Canada, UK, etc all have the option to unionize as well. I think that once one area unionizes the others would be more interested in following. Nothing signals we’re tired of this and we’re not going to simply wait around for others who may not fix the problem than people joining a union. It sends a strong signal to the vfx companies that a trade association is a good idea. We as union members would be connected to all other film crewmembers. With numbers comes the strength to do great things. There are those who want to continue to talk about all of this for the next 2 years. I don’t know about you but I’m tired of talking. In 2 years time our ship will have burnt, sunk and gone over the waterfall. We need to understand at the end of the day the entertainment companies need what we do. They are dependent on us. What we need now is unity and courage by everyone. That is the only thing that is preventing us from making positive changes. It's in Los Angles but there will groups in San Francisco area, Vancouver, New Zealand and elsewhere. There will also be a live stream over youtube. The state of the industry will be discussed along with possible solutions. There will be an hour of questions and answers. The various town centers on the list will be able to send in questions and discuss amongst themselves. There will be an email or twitter hashmark I believe for others to ask questions. You can also submit or post questions ahead of time. We won't have all the answers but it's time we started to make some things happen. There are interesting meetings and discussions already in progress. We are hoping to help reach out the global world of all visual effects professionals and hope to implement some concrete steps to solutions in the upcoming weeks and months. There are other links and twitter accounts in the upper right that would be useful to follow if you haven't already. I was asked in the comments of another post why I didn't care for the term technicians. Aren't there technicians as well as artists doing visual effects? Here's my response that I posted in the comments but some suggested I make it a full post so here it is. My term of 'artists' covers all those creating visual effects. I could have substituted the word vfx workers or vfx professionals. Our profession represents a wide mix of artists, craftspeople and technicians, most who deal with some amount of creativity and some amount of technical knowledge. We have programmers, we have engineers, we have IT, and the full range of people to ultimately generate the shots. The entire crew is required to make our final product. When a director, studio or the press says 'technician' they mean it as a derogatory term. And that's a huge problem for those of us in the industry. It simply allows them to say it's all done by computers. "These technicians just have to hit the right button. They are not bringing any creativity to the process itself." So when a director meets with their key creatives (cinematographer, production designer, wardrobe designer, composer, etc) to discuss the film and have everyone contribute to the film in a creative way, that may not include the visual effects supervisor. Because they're deemed to be just a technician who manages other technicians. The truth is the visual effects supervisor has developed their own eye and is able to be tremendously creative in terms of both the visual and the visual effects of a film. Especially when they leverage their crew. The experience and knowledge brought to the table is great but some directors are not interested because in their view the entire field of visual effects is not creative. The studios look at directors, writers, cinematographers, production designers, and others as creative. They are irreplaceable and each will provide a different look. They bring different levels of quality and style to a film. All of those 'creative people have leverage and are being taken seriously by the studios (writers may challenge that to some extent). They do not outsource that work. They may hire someone from another country but it's based much more on quality and what they bring and much less on cost. In the end the view that we're technicians automatically reduces our leverage. It diminishes who we are and what we do. We're brushed aside with the notion that it can all be outsourced with no loss in quality. And we lose any sense of respect. And that loss of respect is everywhere in Hollywood and helped to create the situation we're in. That's' why our names are last in the credits. It's why award shows and press junkets typically do not include us. So yes, we are artists in my eyes and we as an industry have to keep fighting to make it known that we are in fact doing creative work on projects. What we do ultimately is a creative endeavor built with our skill sets and our talents using technology. If it we weren't creative films would look much worse. And if they allow us to participate as the creatives we are, we can make things even better. Now that we have developed the technology and skill set to create seamless visual effects with few limits, we need to use push the creative boundaries ourselves. We need to respect what we do and what we accomplish. We help to create the magic, we help to create the art that is on the screen. And we need our clients to recognize that and to value our creative contribution. It's the thing that both visual effects artists and companies can use to set themselves apart from others as the technology has allowed leveling of the technical aspects. Just as cinematographers are no longer encumbered by the basics of exposure and paint with light, so can we as individuals and as visual effects artists provide something beyond what the technology is able to provide. The human eye and view point to create something unique. If you had told people years ago that you could create a fake tiger with a key role as a real tiger in a film seen around the world, they would have thought you were crazy. Of course they’d say “I’d certainly be able to tell the difference of a fake tiger compared to a real tiger”. And not just look like a real tiger but act like a real tiger. Yet that is what happened. 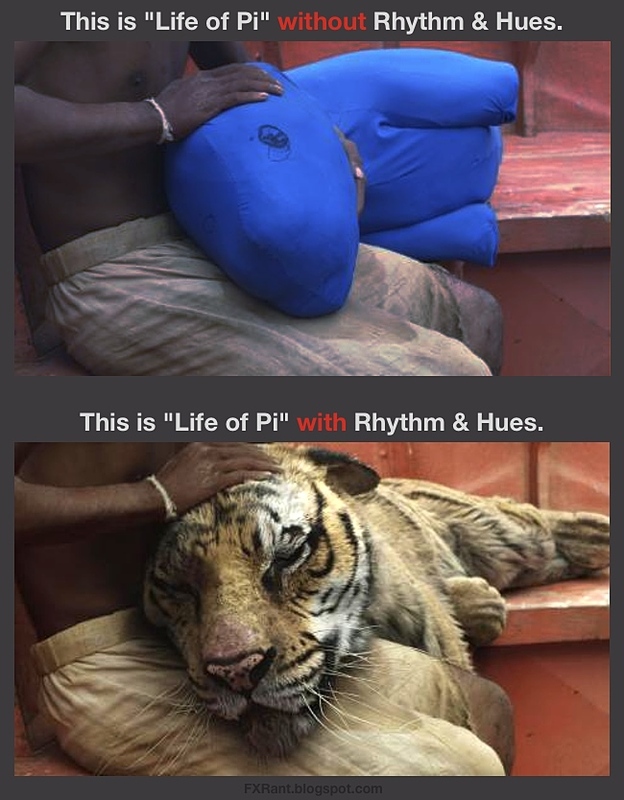 Millions of people viewed Life of Pi and had no idea almost all tiger and animal shots were hand done. I say hand done because people animated those. People painted the tiger texture. People set the fur. Not computers. The computer is a useful tool but it’s the people behind the computers that do the real work. Buy a room of computers and see how many shots they produce on their own. You don’t credit your computer for writing your report for you. And not just the tiger, the entire ocean was added. The entire sky was added. We see miracles all the time on the screen these days but most people take it for granted. Many films you see couldn’t have been made if it weren’t for visual effects. Would the worldwide audience pay $10 to see a rowboat in a pool with a man in a tiger suite? 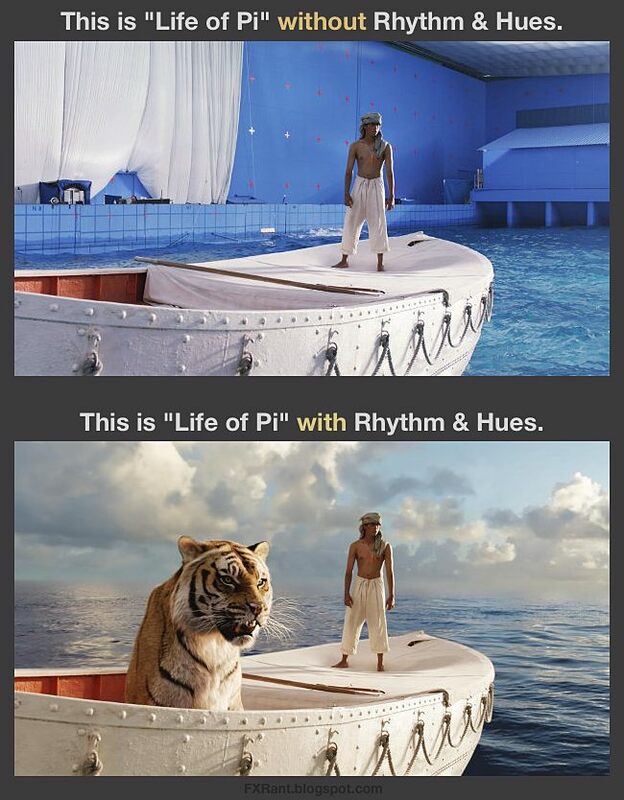 Could the filmmakers have shot it on a real rowboat on the real ocean with a real tiger? Any attempt to do so would have been tragic. We gave the opportunities to the filmmakers to make whatever they can imagine, whatever the story calls for and they make hundreds of millions of dollars, yet they complain about the cost. All films up for this year for the Best Picture Oscar had visual effects. Everyone of them. Agro was able to show Iran. They were able to show trucks and a jet on a runway. They were able to create and manipulate a burning flag. Zero Dark Thirty used visual effects to create Afghanistan, flying special copters and other shots. Most of the visual effects you never noticed, that’s why you’re wondering where they were in Silver Lining playback or Amour. 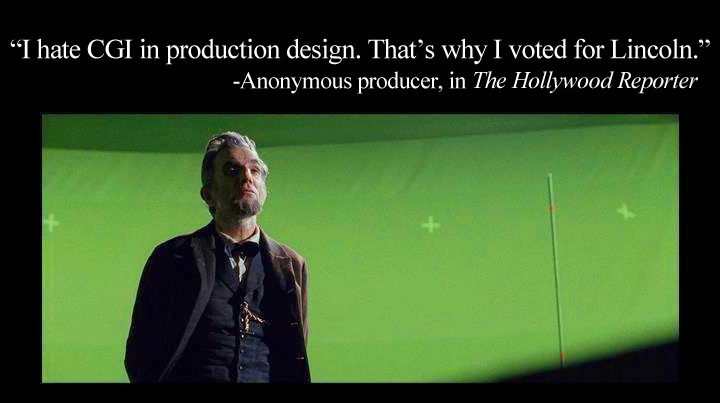 And most slip by visual effects artists as unnoticed as well. That’s how good we have become as artists and how far we have pushed our tools and skills. And it’s not just these films. Almost all films out of Hollywood have visual effects. Most independent films use visual effects. Whether it’s a period film or a buddy comedy it uses visual effects somewhere. The work of visual effects professionals and our art form is everywhere. It permeates most moving media today to a far greater extent than people realize. Those CG animated films viewed around the world use animators, compositors, lighters and other visual effects workers. Once, Game of Thrones and any fantasy and science fiction television show uses them of course. And many regular shows use them. Boardwalk Empire, Breaking Bad, Bones etc all have used visual effects. Many backgrounds are put into scenes you had no idea were done. Stargate Studios Virtual Backlot Reel 2012 from Stargate Studios on Vimeo. Virtual Backlot Demo : New York from Stargate Studios on Vimeo. You know how much airbrushing there is in the world of magazines? Now think of movies and television in that light. How many commercials do you see that have visual effects? How many music videos have visual effects? And it’s not just today. Quite a few films in the past used visual effects extensively. Gone with the Wind, King Kong, WWII films, Charlie Chaplin used visual effects in his film Gold Rush. Those videos games from your iPhone to your Xbox use modelers, texture artists and animators. To all the visual effects haters out there: you've already seen thousands of shots that simply passed you by and you had no idea. The studios and filmmakers have become addicted to the work we do. It’s impossible for them not to use them. Even if it’s just to go in to a film image and change something. The audience has gotten addicted to them as well. They expect to see the spectacular in a tent pole movie. They expect no holds barred in showing them what they need to see to tell the story. How much money has been saved on productions by using visual effects? A lot! Even the ability to shoot on a stage or different location for television saves an amazing amount of money. Now imagine what would happen if there were no more visual effects. What if all visual effects artists stopped tomorrow, put down their computer pens and said, enough is enough. Workers on films, television, commercials, animation, video games, etc. Entertainment content companies, studios and filmmakers would be in deep trouble if that were to happen. They’d have very little content that wasn’t touched by visual effects artists. How much international business would My Dinner with Andre make on the Imax screen? How many variations on Honey Boo Boo would people around the world be willing to drive to the movie theaters and pay $10 to see? How many people would want to see 2 hours of the 'before' footage shown above? How many people would be willing to play Pong and not the latest and greatest graphic game? Because studios push and push and push the visual effects companies. They try so hard to squeeze every penny out of the visual effects companies and workers that they try everything they can. They lobby and get huge subsidies from states and countries to pay them, the studios, to make movies there. It’s not to the taxpayers benefit in those locations. And it's decimating the visual effects industry and that short sightedness is going to bite them. They pit visual effects companies against each other. They let change requests pile up without stop. They squeeze the amount of time to do the work. All of this pushing has resulted in a number of visual effects companies going out of business and forced visual effects artists to be unemployed or migrant workers moving from one country to the next, all so that a penny can be saved. Workers are overworked. Many with no overtime or benefits. And now they have pushed so hard that they have left the visual effects industry in a very fragile state. The very thing that is used in all of their content. The thing that allows them to make their impossible movies. The thing that saves them money. The thing that is used in all of their profitable tent pole movies. And if they push much more they may find it starts to collapse much faster and harder than they expect. They may find that the level of visual effects they’ve been experiencing the last decade will be gone. How will they do their films if the companies collapse and the experienced artists bail out of the industry? How long will they have to delay their films while waiting for an opening at the remaining visual effects company? There’s a need to make this industry sustainable but the studios act like a paper company clearing huge forests without realizing they themselves will soon be left without the substance of their existence. This has the makings of killing the Golden Goose upon which they rely so heavily. All this pushing has finally woken a sleeping giant. The visual effects workers. Year after year of dealing with this type of situation and the workers are getting tired of it. They work and work and produce fantastic results, which in turn makes the studios hundreds of millions of dollars. These artists make the impossible possible and allow for profits on things that couldn’t have been done without their talent and hard work. They’re tired of having no respect and for being treated as they have been. And they have begun to unite with a passion that is growing. Even visual effects workers in India are getting weary. I don't think studios want to have headlines like Apple did with Foxconn but that's where it's being pushed to. If studios and companies don’t change the artists will start making the changes for them. 1. Studios and filmmakers should realize what a gift visual effects has provided them. Visual effects has allowed impossible stories to be told. Visual effects have helped draw worldwide audiences to every media platform. Visual effects provide a power and finesse that has not been seen before. This has a huge impact on the creative freedom at the same time providing huge returns in the box office. 2. Studios and filmmakers should start thinking about the sustainability of the visual effects industry for which they rely on. Squeezing it more will produce nothing but dust. Constantly moving it around the world will not gain them what they desire. They're already exceeded the limits and are now seeing diminishing returns. 3. 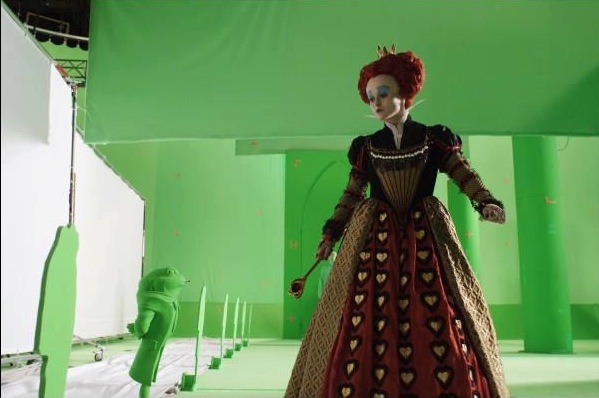 The studios and filmmakers need to embrace visual effects as part of the process. As a necessary part of the process and acknowledge it may be the reason the film can be made. 4. 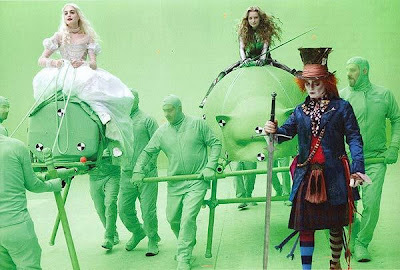 The studios and filmmakers can start treating visual effects as another department with key creative’s. It’s not a black box to be ignored. Visual effects is not a commodity. 5. Studios and filmmakers can work with the visual effects supervisors and producers to design the most bang for their buck. Visual effects can be designed for budget limits from the start. Visual effects artists can push the films beyond imagination. 6. Studios need to put in an effort to control post expenses from their side. They need someone to oversee post-production like they do during production. Decisions need to be made in a timely manner and endless tweaks and changes need to be controlled. Live action doesn't do infinite takes, why should it be necessary with visual effects? Studios might be surprised just how much that step alone could save them on visual effects. 7. Studios and visual effects companies need to work together to shore up the visual effects industry. They need to work together to find a new business model that works for both. They need to start thinking long term, not just this project. 8. Studios and visual effects companies need to acknowledge that ultimately they have people working for them. Those numbers on your spreadsheet are people. It’s their talents and hard work that makes any of this possible. We’re not technicians. We’re artists and craftspeople. 9. Visual effects companies need to act professional and stop underbidding and chasing the work. That's costing them and the industry. That's one of the reasons we are where we are. They need to operate as real businesses. They need to be able to say No at times. 10. Visual effects companies need to adhere to the actual labor laws. If they can’t do the work without breaking the law or treating their workers badly, then they need to re-evaluate what they're doing. Variety article by David Cohen: Is the vfx biz in India tricking artists into working for free? Shows some of what we as visual effects workers are up against. This will be getting worse as studios continue their assault.